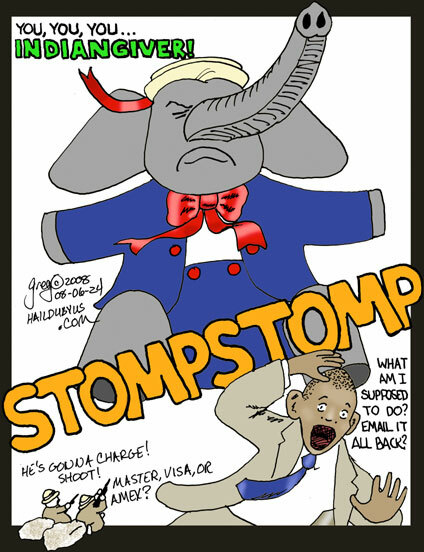 Ooo, Ooo, Ooo, Could Obamarama be a real Politician? | HAIL DUBYUS! Ooo, Ooo, Ooo, Could Obamarama be a real Politician? If I remember Obama correctly, he basically said that he hoped that McCain and he would both agree to the fed campaign limitations. Is it hypocrisy to make the choice that is your only real option? His supporters didn’t give the money to the Democratic Party–they gave it to the Obama campaign. Sticking it in his pocket is a no-go from the get-go. Giving it back? Hell, that would use UP more money than he could return! What’s he supposed to use, PayPal?